Description: While not a beauty of the ages, Ida has a way about her that commands attention. It could be her tall, strong, statuesque bearing, muscled and toned like a true warrior. It could be her brilliant, beautiful smile that lights up her chiseled face. Her rich dirty blonde hair often is pulled back in a practical tail, keeping her face free. Her quiet brown eyes sparkle with life when she works in the forge or the fight ring, giving her a youthful countenance. Her laugh rings, deep from the belly, warming the heart. As a whole, she is beyond more than the sum of her parts, a striking woman, in every sense of the word. Personality: Ida is a simple woman, with simple pleasures in life. She doesn't have much time for fancy things, and doesn't envy the nobility their political games. She loves the feel of moving her body, using her strength to create arms and armor, or any forged thing. She loves the feel of fighting, of hitting and being hit, though never out of cruelty or anger. She's very aware of herself, and the potential harm she could cause, and it gives her a gentle spirit in a lot of ways. She's rowdy and raucous, but has no taste for using her power to bring others harm, and she certainly does not tolerate those that do. People are too much fun to mistreat, and there's no satisfaction in an unworthy competitor. Ida Ferron is a skilled blacksmith, being from a small hamlet not far from, has spent as much time making and fixing arms and armor as she has repairing plows and horse shoes. She married young and had children young. Two boys and a girl. 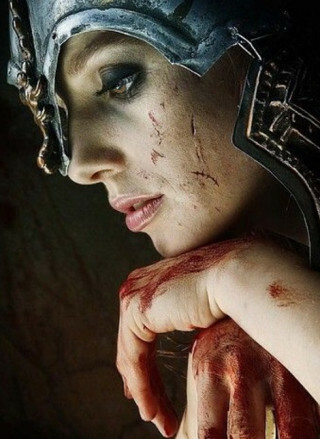 Her husband was a soldier in the Valardin army, and though there's was no great love, he was good to her and honored her and she has no regrets. That their marriage was very cordial and polite, made his death in combat 5 years ago easier to bear. At a glance the strong woman, is the very image of a hard working, polite, plain spoken Valardin commoner. Her profession is not her true love though. Ida is the premier Pugilist of the West Marches. Student of what the Valardin like to call 'the sweet science' she is recognized as one of the very best bare knuckle boxers in the West. After dusk there is many a night where she fights all comers by flickering lamp light, and while her record is by no means perfect, if you were to ask someone to name a fighter that's beat her twice, they probably could not give you a name. She is notable for not only her raw power, gained from working steel between hammer and anvil, but also for her technical precision, and for having a sense of showmanship that does not come at the cost of fair play and sportsmanship. In short she is the perfect fighter to appeal to Valardin sensibilities. She is much loved because of it and she basks in this attention, and it's lead to great success as a smith because, there are quite a few knights and lords that want to say their sword was crafted by a champion. Even Prince Edain seems to be an ardent fan. Her children are all old enough that they have become apprenticed and are now living with their respective masters, and with little desire to remarry, she has decided it is time to live a little and see how good she can really be before age catches up to her and younger fighters pass her by. Taking a job to be one of the Valardin smiths in the City of Arx, Ida plans to work hard, play harder and prove she's the best fighter in the land. Despite dark times on the horizon, Ida can't help but smile looking forward to the adventures she will find. Arn - Direct duke and general. Aethan Very pleasant to talk to, no nonsense. Alexis Dame Ida Ferron, High Lord Edain's Protege and a fine smith. Like myself, she offers both arms and armour. And according to Edain she's a grand pugilist too. It's a bit intimidating to actually meet her. I hope we'll be friends! Amari I was delighted to finally meet her, she's everything I imagined she would be and more. She's as amazing as her craftwork is masterful. Andry It's an honor to have met Dame Ida in her shop and clearly in her element. She is a talented weaponsmith with an equal amount of artistic flair, a combination that I truly admire. Arn She hammers metal and seems to be good at it. That's all I care about even if she might be a drunk I guess. Austen My sister. She made me hot chocolate. Well. She made the servant make me hot chocolate. It was excellent. Like my sister. Cristoph This woman is something, alright. Surrounded by enemies, she helped keep her companion safe long enough for support to arrive. And took down who knows how many enemies in the process! Next time I'm bleeding, I hope she's nearby to stop someone from finishing the job. Domonico A capable fistfighter. That was apparent even though she was hammering a inanimate training dummy. Faye A talented weaponsmith. She seems smart and well-connected, as well as a savvy businesswoman. I certainly would not hesitate going to her if I needed assistance. Fecundo Smith and a pugilist. Someone to talk to about weapons in the future...and I didn't bite. Gaston A no nonsense sort, it seems, with her mind on her business, but amicable. She seems passionate about her work, and to truly enjoy it, and that I think speaks well of her. Looking about her shop, it's little wonder Edain asked her to Arx. Helena A charming walking irony of bellicosity and artistry, Dame Ida Ferron is a lovely and warm hostess and conversationalist when she isn't creating works of beauty and destruction. Isidora I always appreciate honesty and hot cocoa. Not sure which I appreciate more right now. Joscelin I've known the woman for years, since back when I was a journeyman and newly appointed to my shop. She's sass but takes no dishonesty, supportive of those she cares for, more apt to negotiate than punch it out. I fully intend to grow old with this woman, but in a purely platonic way. Lorenzo An exceedingly skilled weaponssmith I have admired the work of for some time. I was delighted to finally meet her, and I look forward to speaking with her again in the future. Lottie Ida is just the greatest. She's kind and talented and responsible! AND FAMOUS! I don't think she realizes how famous she is, or she's just really humble. Either way it makes me like her all the more! Magnus A knightood for her skill should be indicative enough, but I found more than ability when I met her. Pleasant and true company, I didn't notice the passing of time during our conversation. I'll have to spend more time in her shop, both for her abilities with the forge and for my personal enjoyment. Margerie I went to Ida to do a bit of business and found a new friend, I believe. Earthy, forthright, clever, and FUN. While I don't expect to earn a rocking chair after a single meeting, I may have a goal to aspire to. Merek A respectable Knight from the Oathlands. Merek thinks of her as one of the greatest examples of weapon craftsmen ever. Meriah Not that I find weaponsmiths awful. She seems very nice. I just--find it a bit obscene. Monique This woman. I think I'm at least a little bit in love. She's the perfect combination of good cheer, steadiness, and wicked humor. Norwood Dame Ida is an exceptionally talented woman who deserves all of the acclaim she receives for her talents. To bear a sword made by her hand is an honor. Thorley She is the epitome of Valardin. Tall. Proud. Strong. Her gaze sent away the most foolhearty of messengers, however, her fondness for sweets and her care of Joscelin still showed. I hope to see her again in the future - something I do not doubt considering her closeness to the Guildmaster. Tovell Grounded and businesslike, but warm, and with a knack for quickly drawing out the reality and shape of a thing which might only be cloudy in my mind. I look forward to meeting her again.